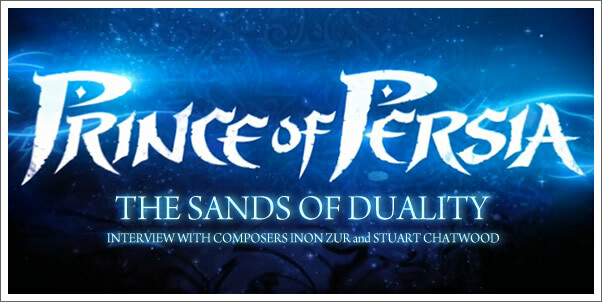 The two names behind the musical voice of the PRINCE OF PERSIA game franchise come together to score the new, next-gen console version of the game which is set to hit store-shelves in just a few days. Both INON ZUR and STUART CHATWOOD share about their histories in the franchise, the unique challenges provided by this iteration of the game, and their process for working together. CC: You two have both been a part of the Prince of Persia franchise for sometime. How have your earlier involvement and experiences with this world and characters influenced your writing for this project? Stuart Chatwood: The prep work I did prior to the first games played a great role with regards to my workflow and writing process on this title. When I was approached to score the first PRINCE OF PERSIA: SANDS OF TIME, I went about expanding my world music CD Library that I had been building up over the prior years. I am a big believer in information absorption on a subconscious level, so in addition to my CD collection, I often found my radio fixed to Radio Darvish on the Internet. When I worked on this title about 6 years ago, a big issue was the lack of good world music sample libraries, so I went about augmenting these with my own sampled instruments. From a character perspective, being around the Prince all these years has helped me with context, and how individual cues fit into the grand scheme of the franchise. CC: Stuart, you've also worked on PRINCE OF PERSIA scores on other platforms (Nintendo DS and PSP) Do you try to bring over some of the more subtle ideas established in those games to this game? Stuart Chatwood: Most of these games involve implementation of the original music form the console titles, so most often a bit rate reduced version of the original game soundtrack is repurposed for the handheld versions. In addition to this, midi translations of my cues are utilized.